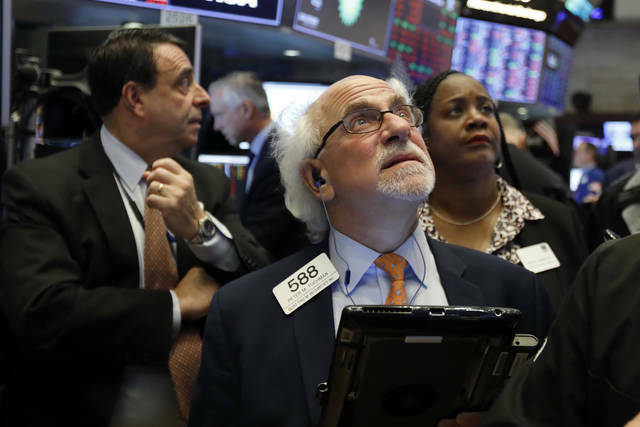 NEW YORK (AP) — U.S. stocks mostly rose Monday as financial and health care companies finished higher, while Apple and other technology companies continued to fall. Asian indexes fell following weak economic data in China and a lack of progress in trade negotiations between the U.S. and China. “Large companies tend to operate with bigger profit margins, and they have more room as a result of that to allow them to cut and to deal with a slowdown,” he said. Stocks plunged in October, but last week was the market’s best week since March. One reason for that recovery was increased optimism about trade talks, as Chinese officials and President Donald Trump said a phone conversation between Trump and China’s President Xi Jinping had gone well. On Monday Xi promised to reduce costs for importers and raise consumer spending power, but he did not address the technology policy dispute between the U.S. and China, a critical part of the trade impasse. Apple lost another 2.8 percent to $201.59. The stock tumbled Friday following a weak fourth-quarter forecast. Apple also said it will stop announcing how many iPhones it sold each quarter. Daniel Ives of Wedbush said that while Apple’s announcement felt “flippant,” it’s actually part of a strategy intended to get investors to see the company as a services provider and not just a device seller. In early August Apple became the first publicly traded company valued at $1 trillion, but Monday’s decline brought its value down to $958.6 billion. After big gains late last week, Japan’s Nikkei 225 index fell 1.5 percent and South Korea’s Kospi dropped 0.9 percent. Hong Kong’s Hang Seng index fell 2.1 percent. Britain’s FTSE 100 rose 0.1 percent while Germany’s DAZ fell 0.2 percent. The CAC 40 in France was little changed.